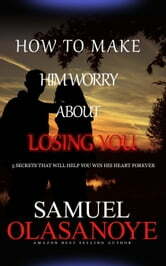 In this book, we're going to talk about how to make your man worry about losing you. In this book, we're going to talk about how to make your man worry about losing you. Wouldn't it be awesome if you make him worry for once about the relationship and even, better make him worry that he might be losing you? I'm pretty sure every woman has asked herself these questions at one time or another, knowing that someone misses you and is afraid of losing you is the ultimate power in relationships. It's easy to assume that the other person is always going to be there for you, once a relationship starts we all hope that we don't have to worry about losing them. I mean, all we want to experience is peace and the security of being in a stable relationship. This book has been put together to teach you what to do. Seven Ways to Meet People: Before They Know What Hit Them!